If you made a list of the audible wonders of the ancient world, the theater of Epidaurus, on the Argolid Peninsula of Greece, would probably come first. Even today spellbound audiences of around 14,000, wherever they’re seated, can easily hear the unamplified voices of actors. The science behind all this was a mystery until a decade ago, when Georgia Institute of Technology researchers concluded that it’s the theater’s array of limestone seats that make the unique acoustics possible. Limestone seating sounds classy, and it’s certainly durable (the Epidaurus theater was largely built in the fourth century BC). Sadly, though, stone seating is a bit too heavy to use in aircraft cabins, and so pilots who wish to speak easily to their customers have come to rely on more modern technology. In the early 1970s, the FAA mandated PA systems for many aircraft, and today, of course, public address systems are standard equipment. As Tom Wolfe has written, there was a time when many pilots, in the U.S. at least, proudly adopted certain aspects of Chuck Yeager’s distinctive Appalachian accent and reassuring speech patterns. But in terms of the content itself—that is, which information we mere mortals choose to include in our announcements—what exactly is the Right Stuff? Whether we’re flying our family halfway across the state or hundreds of customers halfway around the world, these announcements are an opportunity to think about the information we share with those who travel with us—only a few of whom, we must admit, will love flying quite as much as we do. As a long-haul pilot, seated upstairs in the 747, it’s inevitable that the PA will be my best opportunity to interact with most of the passengers—and unlike with many clever PA systems in airport terminals, pilots and crew don’t have the option of recording their announcement before it’s broadcast. So over the years I’ve come to regard these announcements as an opportunity for continual professional improvement. At work, in fact, we’ve just been given a new set of training modules, based on presentation and public speaking expertise from the business world. And whenever I fly as a passenger, I listen carefully to what other pilots say, in order to pick up tips for myself. Here’s some of what I’ve learned, or had to unlearn, over the years (let me know your own tips via the website skyfaring.com). Perhaps the hardest part of the first announcement we make is getting the audience’s attention. Many travelers fly so frequently that they may start to tune out announcements, especially because so much of the safety information is, for obvious reasons, carefully chosen and standardized. One trick, then, is to slightly vary the start of the announcement. My favorite such variation, which I often hear from senior captains, is “Ladies and gentlemen, boys and girls”—it catches the ear and may also, of course, reach a future pilot or two! In that first announcement to passengers, before pushback, one question I struggle with is about how much information to include about the route—aside, of course, from the flight time, which everyone wants to know. On many routes, for example, from Heathrow to New York, most of the passengers are regular travelers, often businesspeople with a personal flight plan that involves maximizing work or sleep. No matter how excited I am to be flying, it’s fair to say that not all of them are going to be quite as interested as I am in precisely where we will say farewell to the craggy Irish coast or near which village we’ll make landfall over Newfoundland. But on every flight, of course, there are people making their first-ever trip by airplane. Some, indeed, may be making the only long-haul journey of their life, and the fact that we’re flying across an entire ocean to another continent is, after all, pretty exciting. For them, I want to do a little more than just point them to the moving map channel. On other routes, especially longer ones that are particularly popular with leisure travelers—I don’t think I’ve ever done a Cape Town without at least a few honeymooning couples onboard—I try to give out a few more key snippets of geographic information that, to me at least, suggest the true scale of our journey—“across the Sahara,” “passing just to the west of Timbuktu,” that sort of thing. And I like to mention where I think the sun may come up (not always an easy calculation!). It’s exciting to think about where our new day will start in a faraway place. There’s another passenger we want to cater to in our initial announcement: the nervous traveller. As every pilot will know, even with the clearest forecast on the sig weather chart, it’s not possible to promise a perfectly smooth flight. But a reassuring tone, relaxed but professional, can help travelers settle in, especially when it comes to the necessary reminders of seat belt policy. Once we’re in flight, of course, we try to avoid making announcements, as most passengers are working, watching a movie or trying to sleep. One exception: When there’s turbulence of the kind that no one could sleep through, we’re advised to make a reassuring announcement about the expected duration, and any steps we’re taking to reduce it, such as changing levels. Otherwise, if there’s a sight really worth seeing during the cruise, I’ll instead phone the cabin crew, and let them find individual passengers who may be awake by the window. Especially with the Northern Lights, I wouldn’t want anyone who can’t sleep to miss out on something most people go a lifetime without seeing. For the cabin crew, of course, such information is an opportunity to “give” a fascinating experience to a customer. 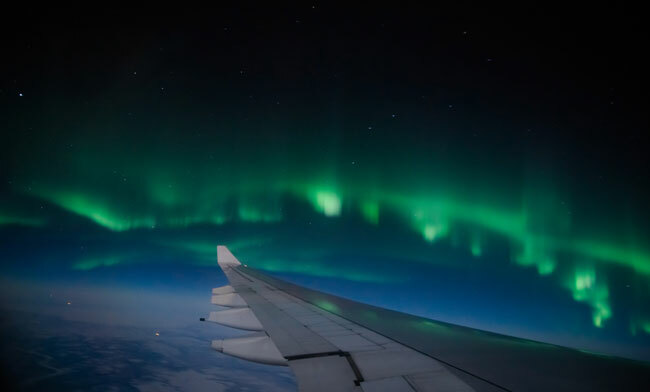 Another reason to give out such information through the cabin crew, rather than over the PA, is that on a widebody jet, of course, a lot of passengers sadly won’t be able to see whatever wonder you’re describing outside the window, especially if it’s only on one side of the aircraft (Northern Lights—the clue is in the name). The next PA is the pre-landing one, and that’s probably my favorite. Its content can indirectly sum up what’s so amazing about air travel—that we’re coming to a new city, new weather, a new landscape, all perhaps on a new day. When I fly as a passenger, I notice that it’s during this announcement that many passengers raise their window blinds and look down at the world below, perhaps for the first time in the 12 or more hours that have passed since takeoff. When I’m preparing to make this announcement, the first thing I do is ask my colleague what time he or she thinks it is at our destination, and compare their answer to mine! Working entirely in UTC, it’s all too easy for us to get it wrong, and I admit to having done so on a couple of occasions so far in my career. I’m particularly keen to check the local time after overnight sectors to the Far East, or during any periods when Europe and the U.S. aren’t quite synched up on the spring and autumn time changes—which is, of course, an understandable cause of occasional confusion for some passengers as well. I’m particularly careful on flights to India (UTC + 5:30, related, I’m told, to the desire to have a single time zone for the entire country) and anywhere else that the time difference isn’t in whole hours (I haven’t yet flown to Nepal, which is UTC +5:45). The pre-landing announcement also reveals some of the large gaps between what pilots and passengers find interesting. Like many pilots, I’m fascinated by weather. When I listen to or read the ATIS, I tend to look first at the three C’s—Cloud base, Crosswind (or tailwinds) and runway surface Conditions. Few passengers, we pilots must accept, have any reason to care about any of these. I like to think about a hotel I’ve stayed at in Vancouver. It has a clever digital display of the current weather built into the mirrors by the elevators on every floor. There are just five (combinable) options: Cloudy, Sunny, Rain, Snow and Windy. Honestly, that, plus the temperature, covers everything the nonprofessional wants to know. Nobody but us cares about the altimeter setting, and that’s why we’re pilots. Conversely, there’s something that passengers are interested in, but pilots may not be, at least for that sector. That’s the general forecast for the next three days or so—of particular interest to those going on vacation. I’ll always try to check the weather on my phone before takeoff so that I can give an idea of what travelers can expect beyond the time band of the TAF (and perhaps long after we’ll have flown back). I also look up total snow accumulations, which can be hard to gauge from a TAF, but which are a useful part of a winter storm forecast for travelers once they’re on the ground. There are a few other gotchas with the weather. As a new pilot, it’s easy to forget that what we think of as ‘excellent’ weather can be quite different from what passengers would hope to find! As a trainee pilot, I was a little surprised to realize that CAVOK doesn’t necessarily mean it’s sunny on the ground. There are also the often-significant differences between the weather at the airport, and in the city it serves. San Francisco is probably the best example—once I told passengers the expected time in the descent that they might look out for the Golden Gate Bridge, based on fine conditions on the METAR from SFO. Inevitably, the famous view was completely hidden by a thick stream of racing fog. Microclimates indeed! As for “off-script” scenarios, such as when there’s a delay or a technical problem, it’s always best to be honest with time estimates—including when we simply don’t know for sure the extent of a delay, however hard that is to say out loud. A good way to approach that situation, I’ve learned, is to simply be honest, and then promise to “update you in 20 minutes,” whether or not there’s new information to add. And then I start my stopwatch or set a timer on my phone. In-flight, the most interesting PA scenario comes after a missed approach, one of which I end up flying every year or so. A full-energy go-around is something that everyone in the cabin notices, and yet it can be a few minutes before we have time to speak—which makes our choice of words even more important when we do. Perhaps the most controversial question when it comes to PAs is the joke. Our training materials emphasize that while the right humor can go a long way, it’s really difficult to judge an audience that you can’t see or hear, as every professional comedian knows (and, sadly, no aircraft PA system I know of has a laugh track we can feed in). Jokes, of course, may also be more difficult for non-native English speakers to understand, and on flights with international cabin crew onboard, jokes simply may be hard or impossible to translate. When I flew to LAX regularly, we were often towed to our final parking position after shutting our engines down. 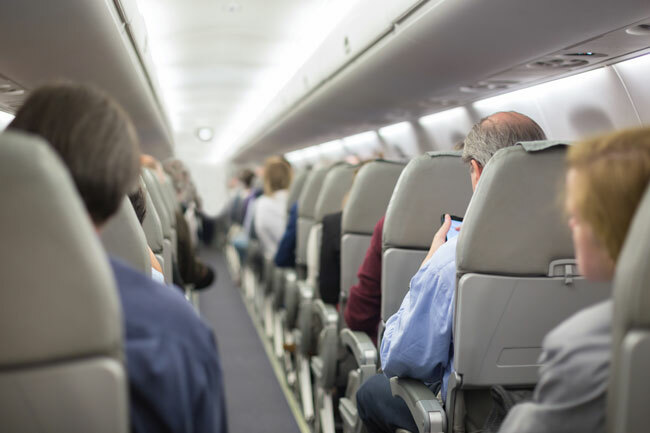 It’s important to tell passengers about that in advance, and to re-emphasize the seat belt sign, so they know it’s not yet safe to stand up when they hear the engines stop. So—this is Los Angeles, right?—I always referred to this procedure as “valet parking” in my announcement. I’m told it usually got a laugh—I hope for the right reason! We’re also strongly encouraged to avoid jargon, whether we’re talking about parts of the airplane or about anything else. Terms like “APU,” “ATC” and “slot” may not be widely understood. Deicing in Vancouver recently, the captain didn’t tell the passengers about the Type I and Type IV stages, the mixture or the holdover times. He did tell them how long the process would take, that there would be plenty of deicing fluid visible on the wings when they were finished and roughly what time we could expect to be in London. I made a mental note of what he said, and how he said it, and I’ll try to remember all that the next time it’s my turn to pick up the hand mic on a snowy day. And, as for my Chuck Yeager accent? Well, I’ve still got a ways to go, but like my PAs, in general, I’m hoping it’s getting just a little bit better every time I fly. Mark Vanhoenacker is a senior first officer for British Airways who flies Boeing 747-400s. He’s the author of “Skyfaring: A Journey with a Pilot.” You can reach Mark at [email protected]. As a pilot for a major global carrier, I don’t think most passengers care. I know the business travelers just want the announcements to stop. I tell them the mandatory seatbelt, when we will be there, and the weather there. Then I shut up and leave them in peace. I respectfully disagree with Warren. I almost always want to hear what the Captain or the First Officer has to say. I have no desire, however, to hear credit card or other commercial pitches.